Una recensione di Due South di Stan Mir è stata pubblicata oggi su Hyperallergic. WILMINGTON — In 2007, Isaac Julien made “Western Union: Small Boats,” a video work set in Palermo, Sicily, which portrays the trauma of illegal immigration against the backdrop of a mythological Europe. Julien has said that Luchino Visconti’s 1963 film The Leopard, which stars Burt Lancaster and chronicles the changes in Sicily during the unification with Italy in the nineteenth-century, was an inspiration for his work. Two stills from the video are presented in lightboxes in Due South, a cross-cultural group exhibition focused on Sicily at The Delaware Contemporary that runs through April 30. “Western Union Series No. 9 (Shipwreck-Sculpture for the New Millenium)” (2007) is the most striking of the two stills. It contains no human subjects. The promise of the Mediterranean sunlight and blue sky contrasts with the reality of shipwrecked boats used by migrants to cross the sea. The boat on the left contains a haphazard pile of wood and rope, and in the upper right of the image there appear to be life preservers. Matthew Mazzotta’s and Sujin Lim’s single-channel video, “A Day at the Beach” (2017), is displayed directly across from Julien’s photograph of abandoned boats. There is a distinct melancholy to this video, which portrays a small children’s boat subject to the turbulent waves on a Sicilian beach as they crash endlessly against the shore. Last year, a group of North African refugees drowned within view of this beach. Throughout history Sicily has been a home for those seeking a better life, as well as a bastion of privilege. The ceilings and décor of the grand palazzos of the old nobility provide the setting for Jane Irish’s paintings and drawings included in the show. Irish works in the tradition of ceiling painting as it runs from the Renaissance through Rococo. Instead of its traditionally spiritual subjects, however, Irish turns her canvases into subtle forums for resistance and critique. The bright red ceiling in “Palazzo Lanza Tomasi (Lampedusa’s office)” (2016), which was painted in one of the rooms used in The Leopard, lends the painting an air of menace, and contrasts with the dark earth tones of the walls and floor. In the foremost oval on the ceiling, Irish has painted an Arabic phrase, which harkens to Sicily’s past and to its present as a destination for migrants of Arabic descent. Alice Guareschi’s lenticular print, “Distance, language” (2010), strikingly embodies this fact. If one stands just left of the center, it reads, “Distance becomes the secret language with which the conversation takes place.” Move to the right and the phrase changes to “Language becomes the secret distance with which the conversation takes place.” If one stands in the middle, the phrases overlap illegibly. It’s notable that an Italian artist chose English over her native tongue for this work. Perhaps Guareschi’s choice reflects an interest in critiquing American dominance of global affairs. But her decision also mimics the linguistic challenges that Italian speakers and foreign migrants might face when they meet each other in the street. English, perhaps, becomes the common language, even though it cannot resolve the semantic distances between them. Physical closeness is one of the themes in Massimo Vitali’s “#2815 Solarium Verticle” (2007). Taken from a podium several meters high, Vitali’s photograph portrays an overcrowded pier where people have gathered in their swimsuits to sunbathe and socialize. The light and color are magnificent, as is the open display of the human form. Vitali, however, isn’t interested in depicting the subtler pleasures of the body — in recent years he has photographed a number of beach scenes from above to comment on “cosmetic fakery, commodified leisure, and rigid conformism.” The bird’s-eye view offers a clear picture of social grouping and the sameness among the sunbathers. David Scott Kessler’s video installation “The Peasants Shouldn’t Know How Good It Is” (2017) takes place during the weeklong festival, Festa della Madonna, in Tusa, Sicily. Kessler, an American, shot the video from a fixed position at ground level, which puts the viewer on the same level as the stray cats that wander and play in the streets, as well as the Cirneco dell’Etna, hunting dogs brought from ancient Egypt. The dogs live pampered and healthy lives with one of Sicily’s aristocratic families. One of more amusing parts in the video occurs when Kessler places the camera outside of the family’s kitchen door while the dogs watch two casually dressed aristocratic women cook dinner and sing along with Simon and Garfunkel’s “Scarborough Fair.” When they’re not looking, one of the dogs sneaks into the kitchen to steal a piece of cheese. The women don’t notice and eventually the sequence ends. Kessler’s video is an amusing allegory of the peasant’s perspective, but it also subtly demonstrates the layering of cultures: the dogs brought from Egypt, the music of Simon and Garfunkel, and the quiet dialogue in Italian between the two women. One of the more poignant works in the exhibition is a letterpress print, “The Eight Winds” (2017), by Bernstein, the curator. Printed on white paper in large letters are the eight Italian words for wind: “maestrale, tramontana, greco, levante, scirocco, mezzogiorno, libeccio, and ponente.” Below these words are the English equivalents, with “prosperity” and “decline” at the top of the list. 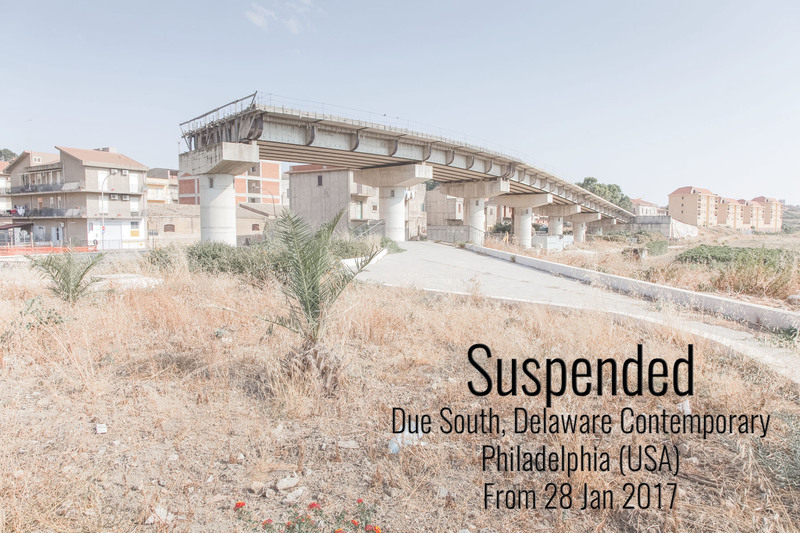 Due South continues at The Delaware Contemporary (200 South Madison Street, Wilmington, Delaware) through April 30.